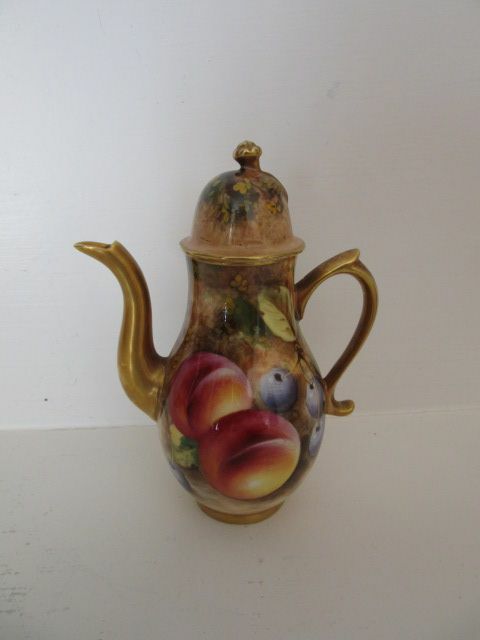 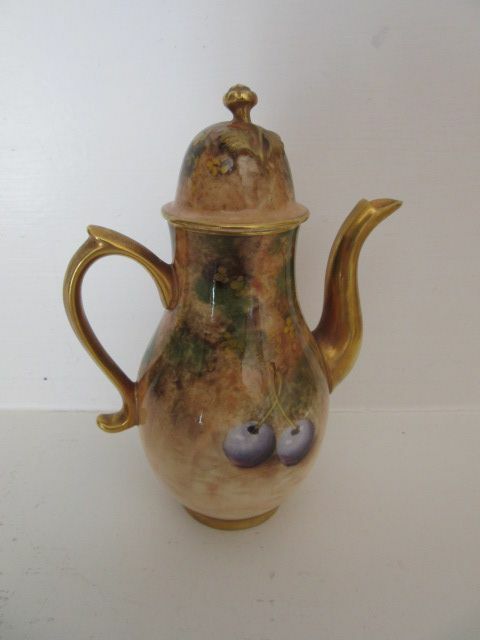 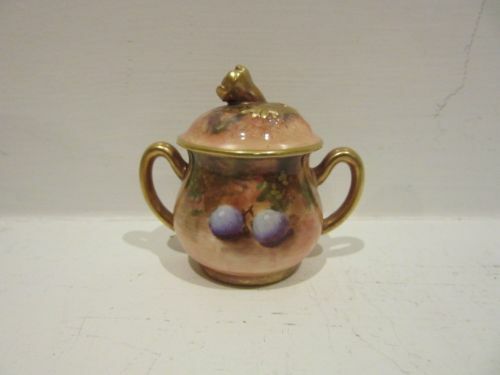 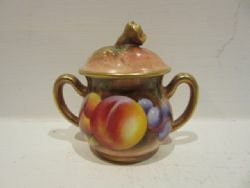 A Miniature Royal Worcester Fruit Painted Coffee Pot By Roberts. A good Royal Worcester porcelain miniature coffee pot and cover, with nicely painted fruit decoration by William Roberts. 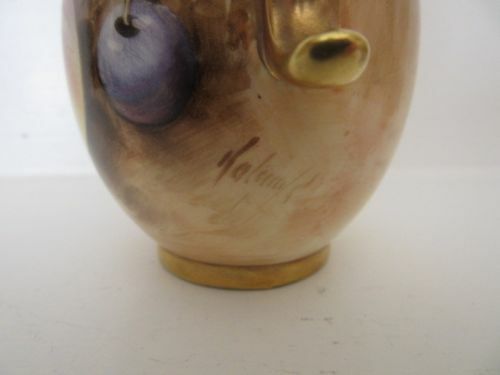 Measuring approximately 5"tall x 3.3/4"overall width, it has the black factory stamp for 1959 and is in excellent condition with no damage, crazing, scratches or restoration and the gilding is bright and virtually without wear. 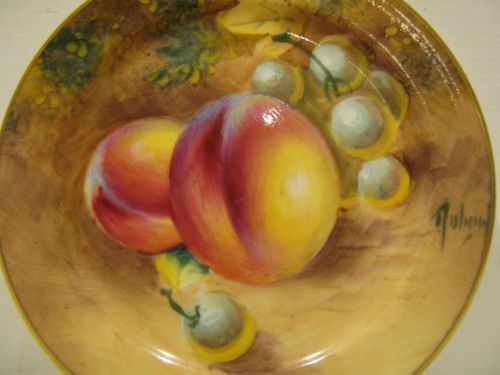 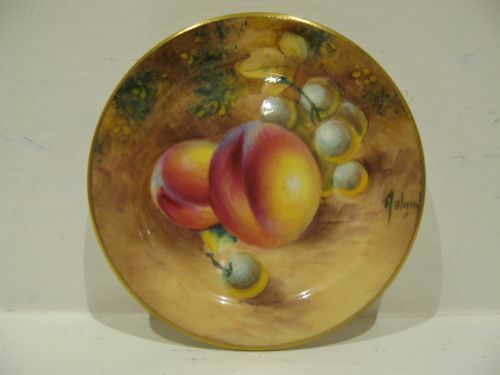 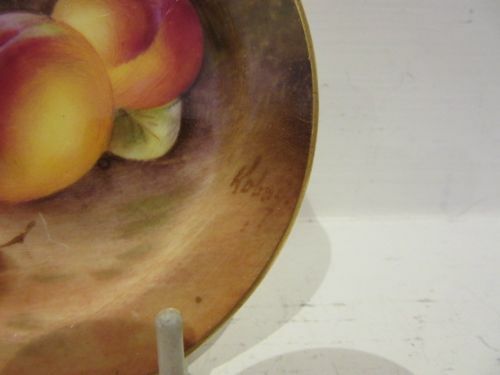 A Miniature Royal Worcester Fruit Painted Plate By Roberts. 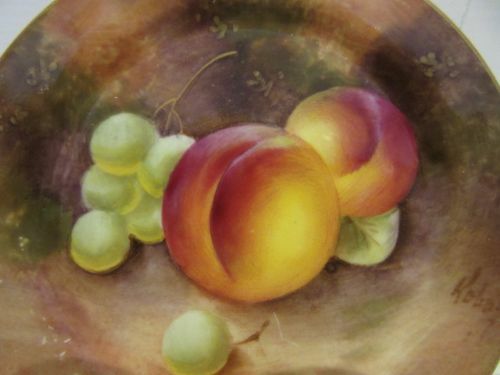 A miniature Royal Worcester porcelain plate, with painted fruit decoration by William Roberts. 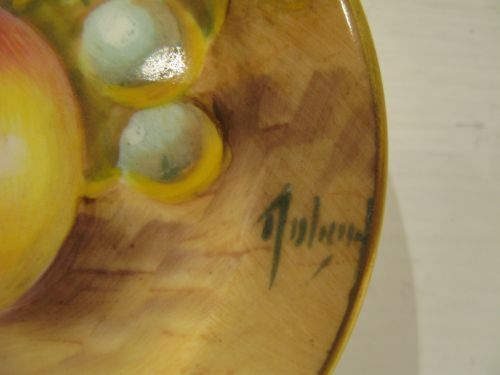 Measuring approximately 3.1/2"diameter, it has the black factory stamp for circa 1970 and is in excellent condition with no damage, crazing or restoration and the gilding is bright and virtually without wear. 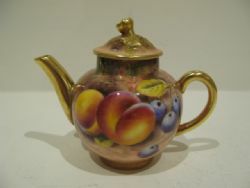 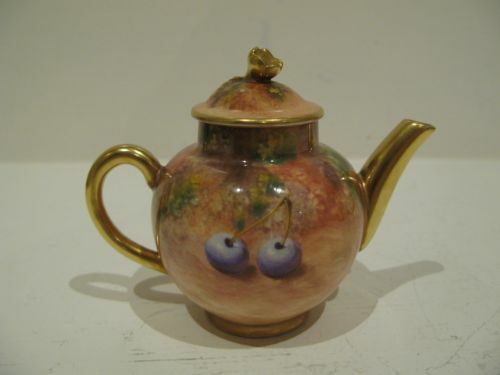 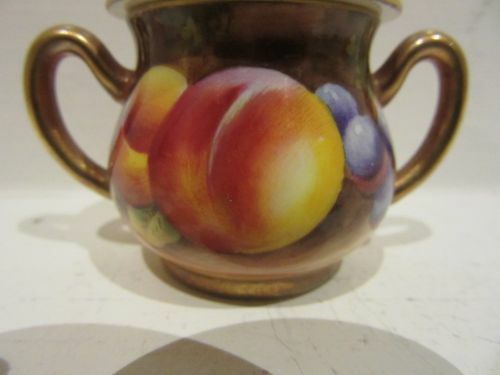 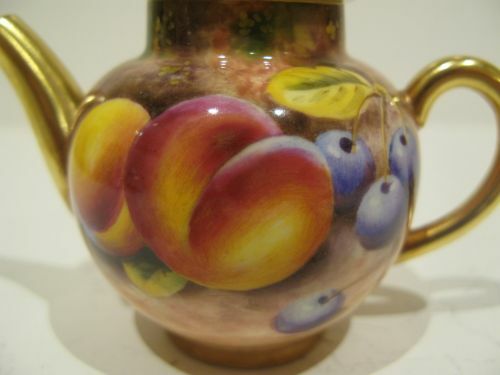 A Miniature Royal Worcester Fruit Painted Teapot By Roberts. An attractive, miniature Royal Worcester porcelain teapot with well painted fruit decoration by William Roberts. 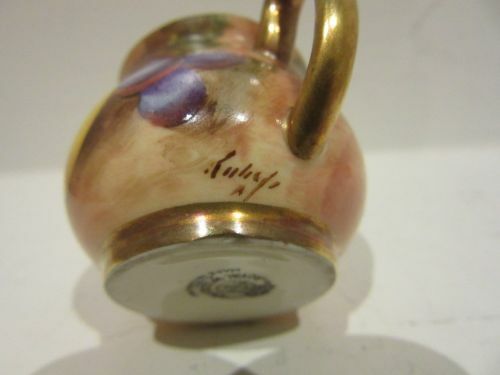 Standing approximately 3.1/8"tall x 4"wide over the spout and handle, it has the black factory stamp for 1955 and is in excellent condition with no damage, crazing or restoration and the gilding is bright and virtually without wear. 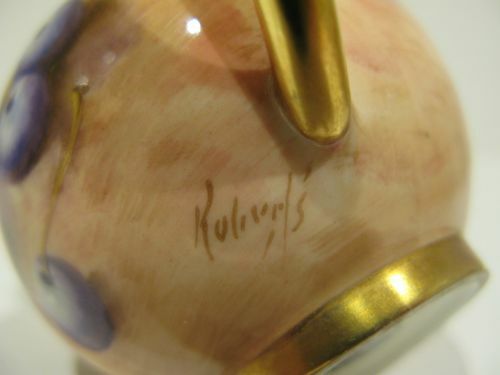 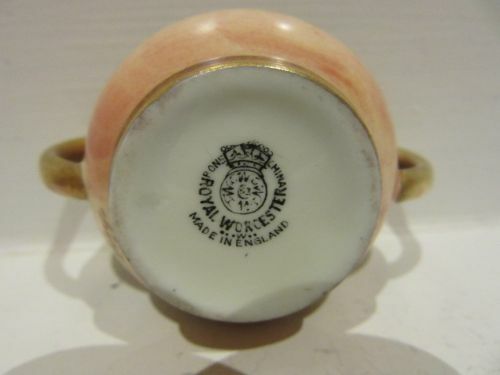 A Miniature Royal Worcester Lidded Sugar Bowl By Roberts. 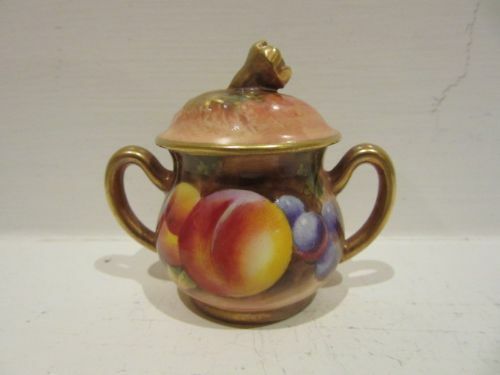 A good miniature Royal Worcester lidded sugar bowl, with nicely painted fruit decoration by William Roberts. 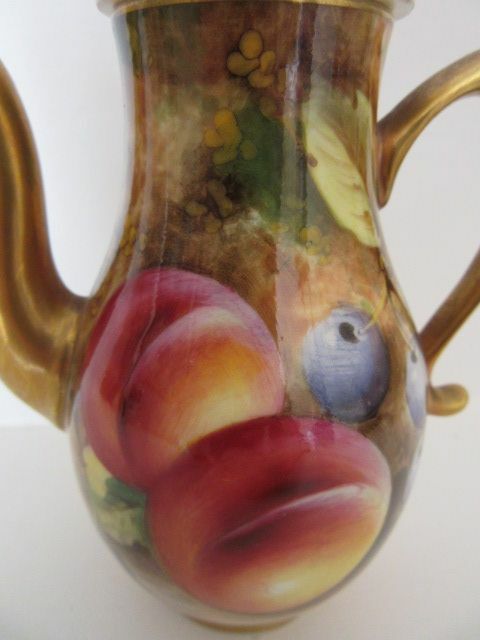 Measuring approximately 2"overall height x 2.1/4"wide over the handles, it has the black factory stamp for 1955 and is in excellent condition with no damage, crazing or restoration and the gilding is bright and virtually without wear. 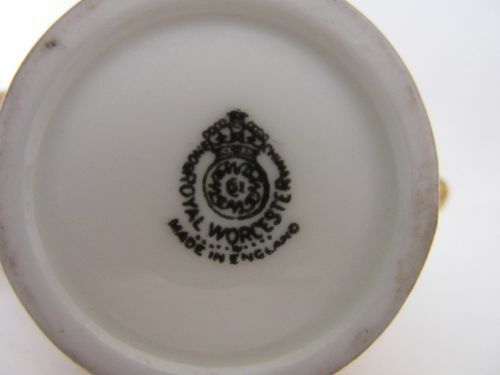 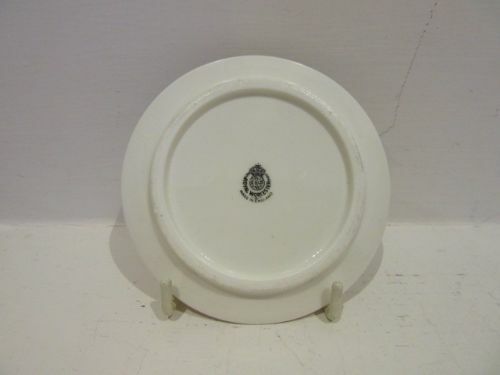 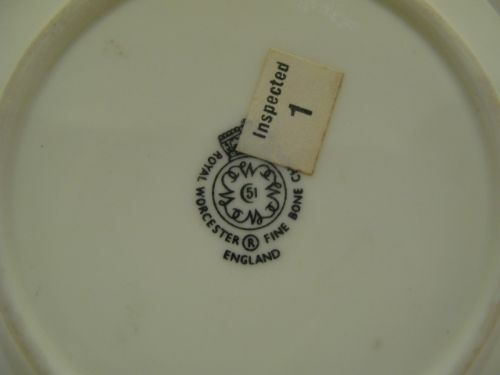 A Miniature Royal Worcester Plate By Roberts. 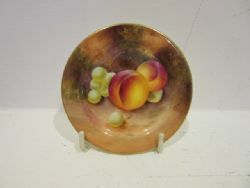 A Royal Worcester porcelain miniature plate, with nicely painted plum and green grape decoration by William Roberts. 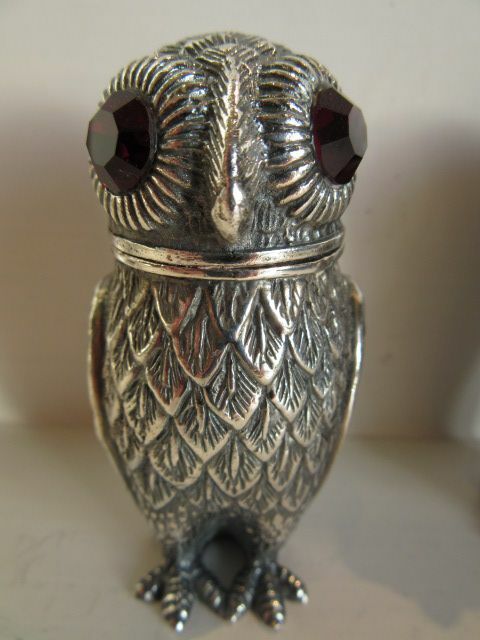 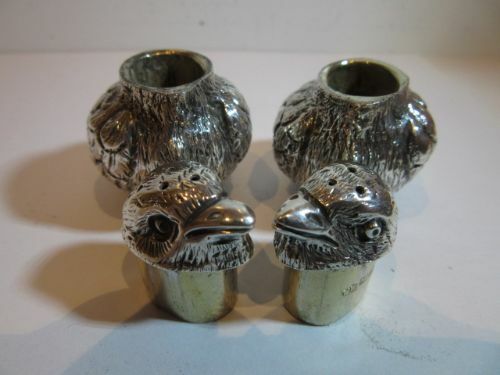 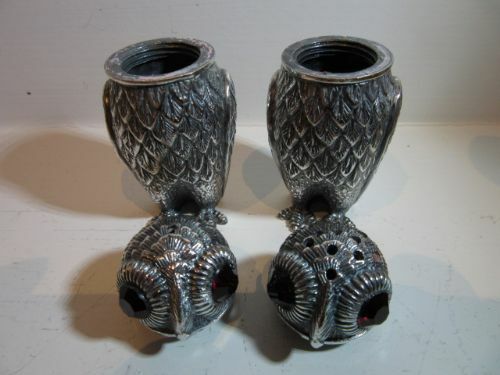 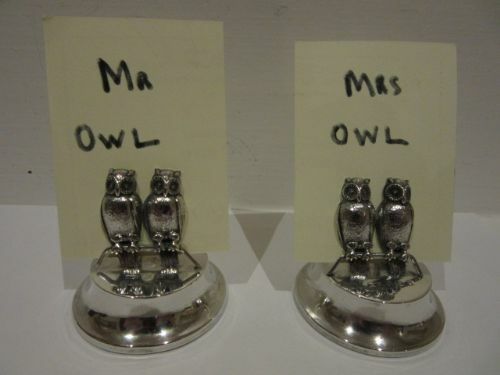 A Modern Pair Of Continental 800 Silver, "Owl" Form Salt And Pepper Pots. 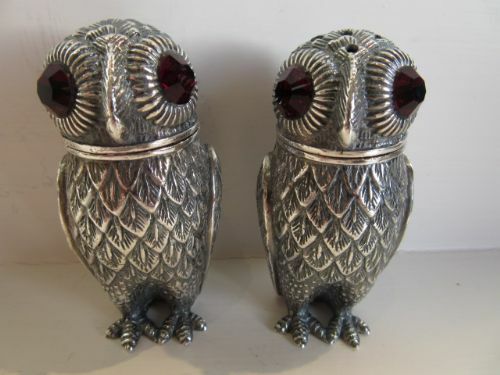 A modern, good sized pair of 800 grade continental cast solid silver salt and pepper pots, with well detailed bodies, red glass eyes and removable screw-top heads for refilling. 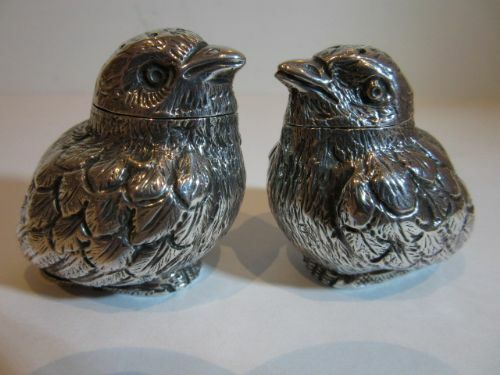 Measuring approximately 2.3/4"tall x 1.1/4"wide, they have the "800" impressed silver hallmark under their bases and are in good condition with little or no rubbing to their feathers and the screw-tops fit smoothly and firmly. 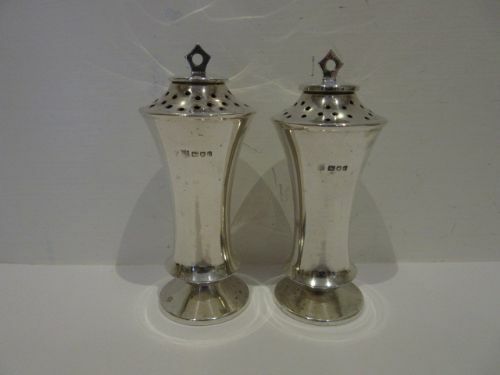 A Novelty Pair Of Edwardian Silver Open Salts, Chester 1905. 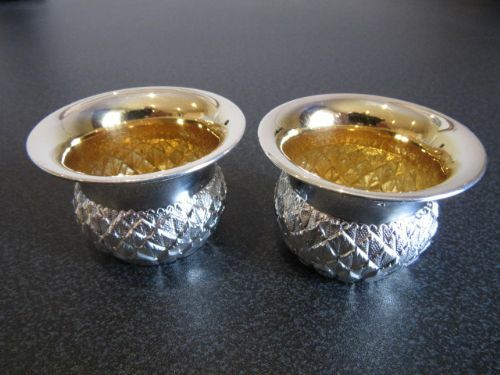 An attractive novelty pair of Edwardian solid silver open salts with gilt interiors, in the form of thistles. 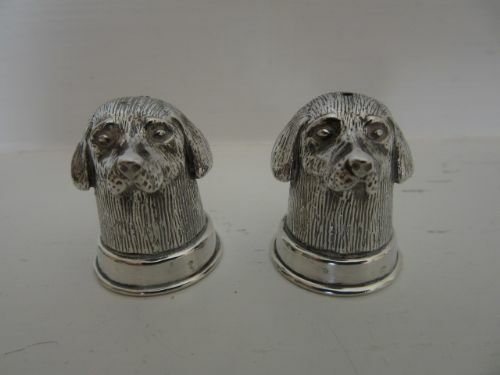 Measuring approximately 2"diameter x 1.3/8"tall, they have clear hallmarks for Chester 1905 by John Millward Banks and are in lovely condition with no damage, dents or solder repairs, and are beautifully clean and without salt marks. 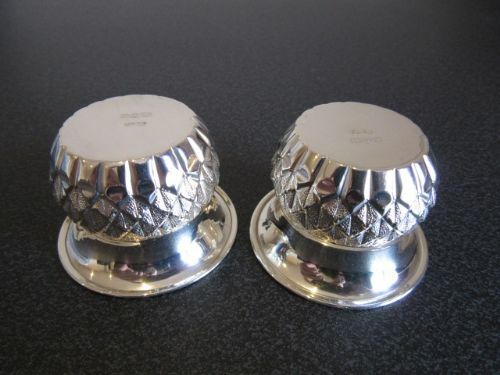 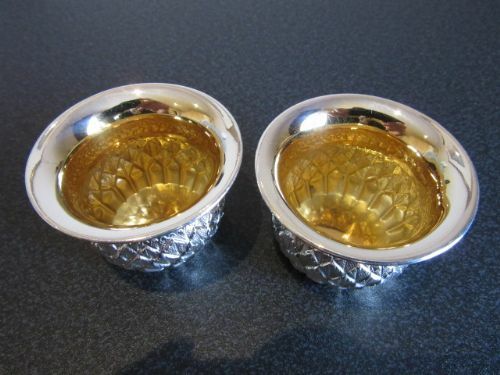 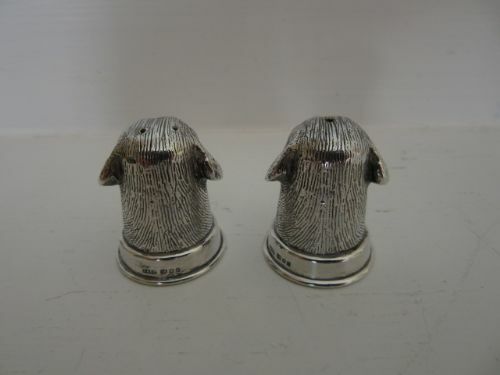 A Novelty Pair Of Silver Salt And Pepper Pots. A small pair of cast solid silver salt and pepper pots in the form of dogs heads. 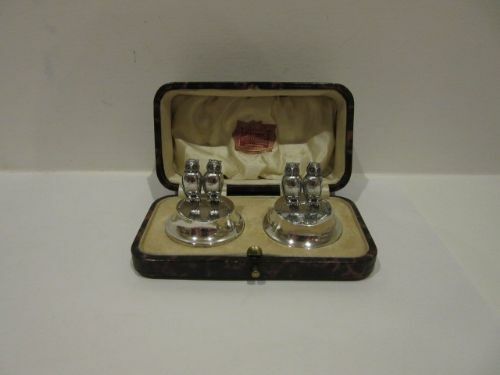 Standing approximately 1.1/8"tall x 7/8"maximum diameter, they are both hallmarked for London 1988 by Clive and Clarissa Cooke and are in very good condition with no damage or repairs and complete with their original plugs under the bases. 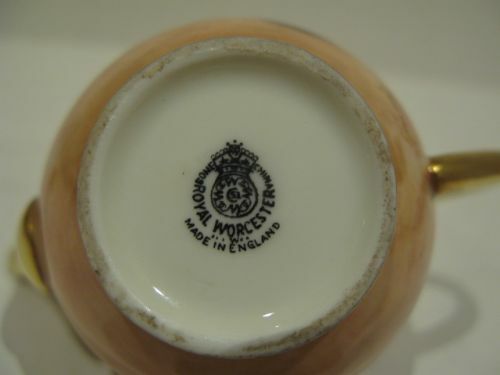 A Novelty Shaker In The Form Of A Toby Jug, Birmingham 1911. 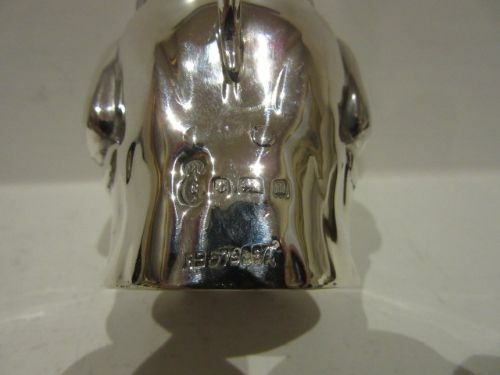 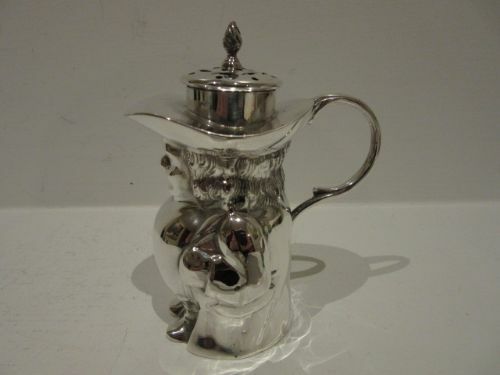 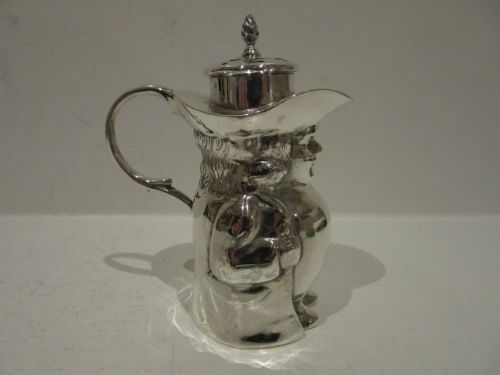 A most unusual and collectable solid silver shaker in the form of a toby jug. 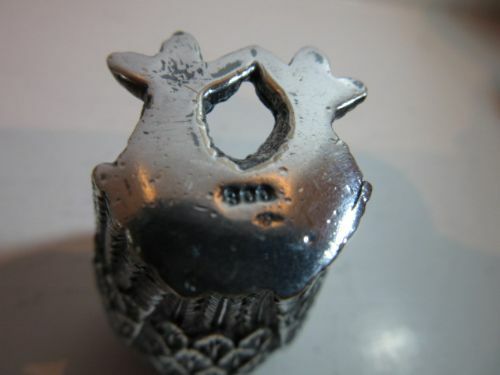 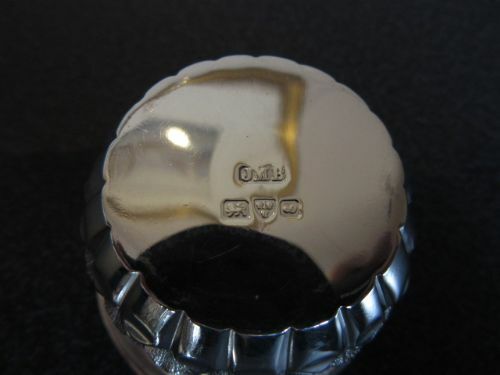 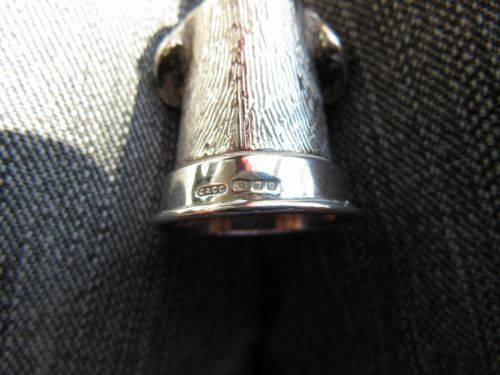 Standing approximately 3.3/4"tall x 2"wide x 2.3/4"deep over the handle, it is stamped with its registration number, and it is fully hallmarked for Birmingham 1911 by Hays & Co. 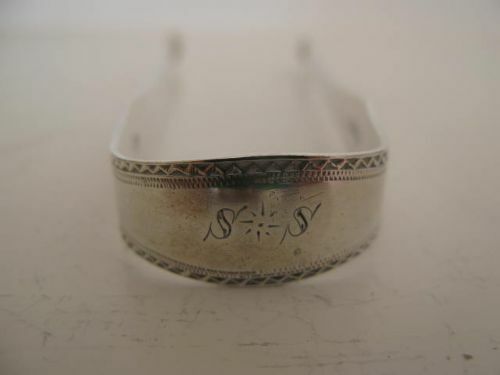 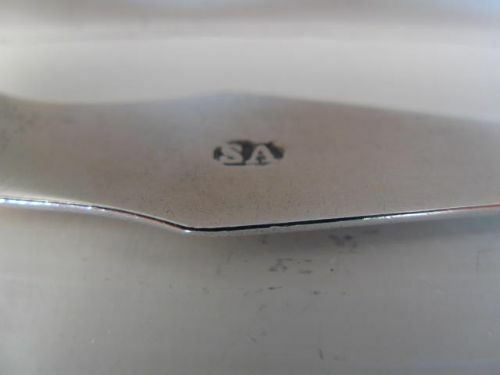 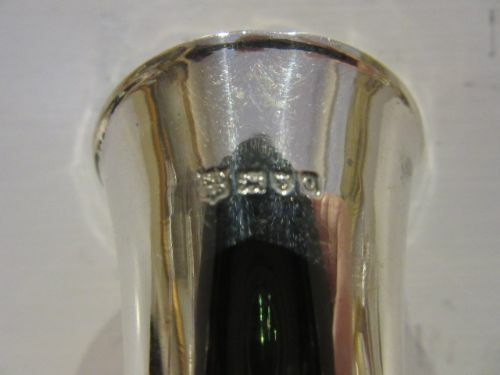 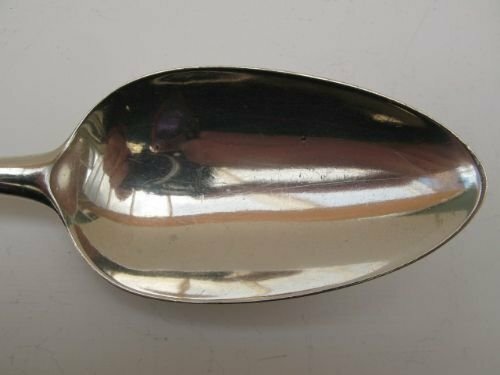 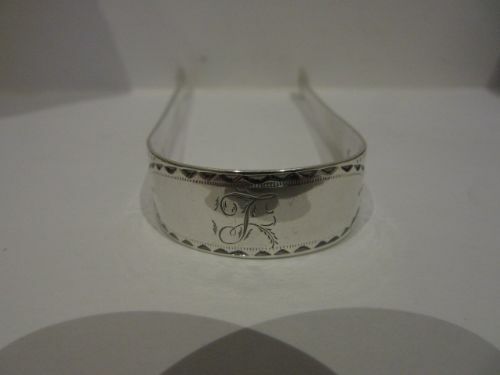 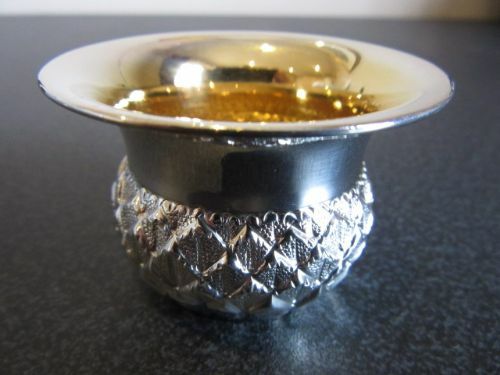 It is in excellent condition with no damage, dents or solder repairs, the pull-off lid fits firmly and snugly and the silver is clean and has no black salt or sugar stains. 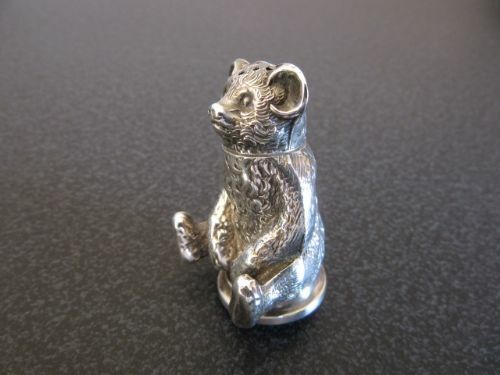 A Novelty Silver Pepperette In The Form Of A Seated Teddy Bear, Birmingham 1909. 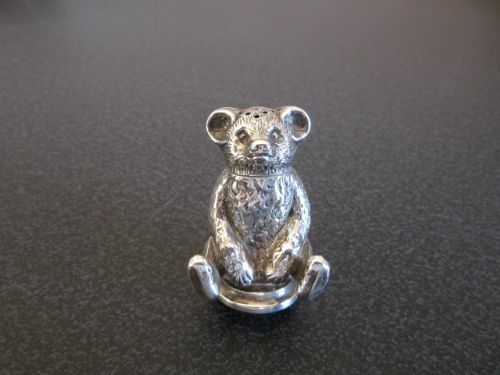 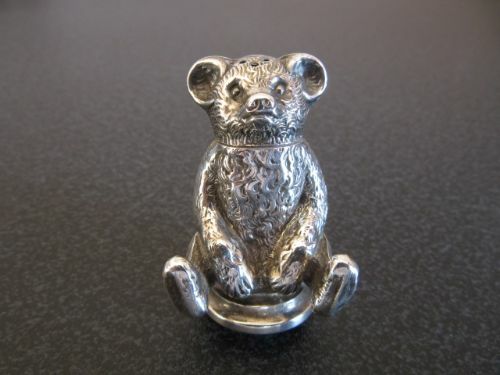 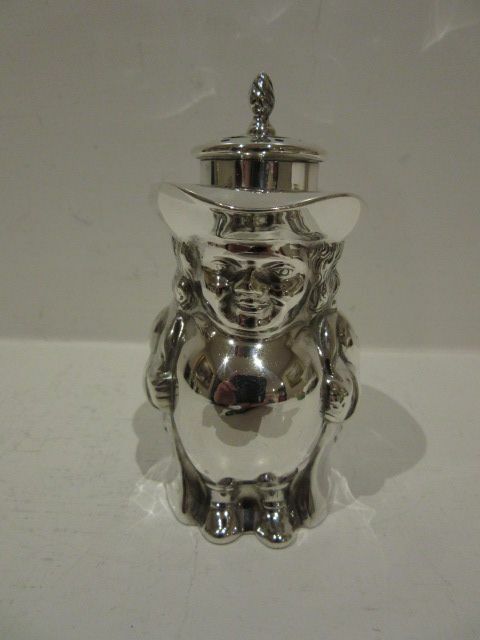 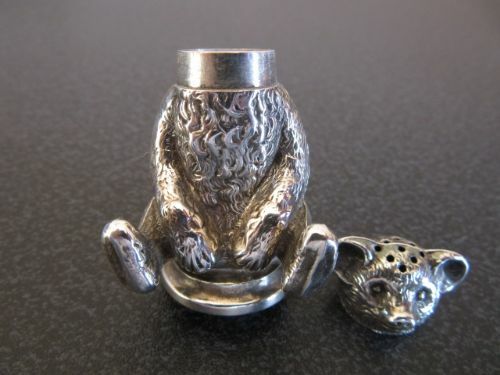 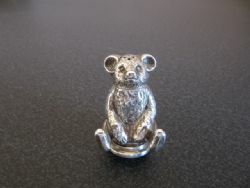 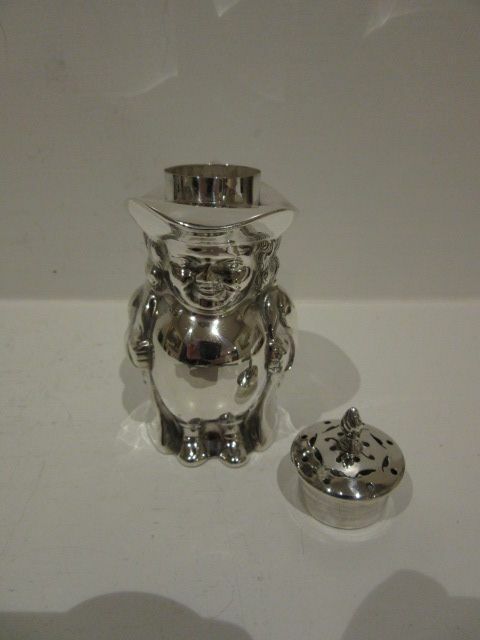 A good Edwardian solid silver novelty pepper pot, modelled as a seated teddy bear with pull-off head for re-filling, which is a snug and secure fit. 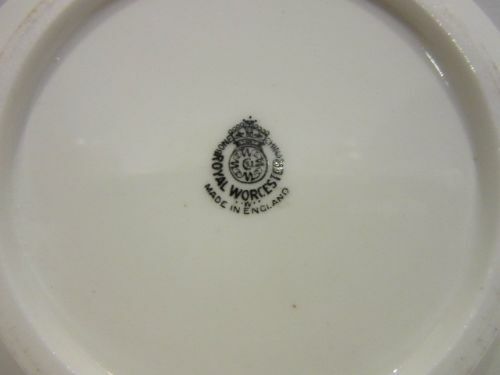 Measuring approximately 1.1/8"wide x 1.3/4"tall, it has clear hallmarks for Birmingham 1909 by Crisford and Norris and is in very good condition without damage or repair. 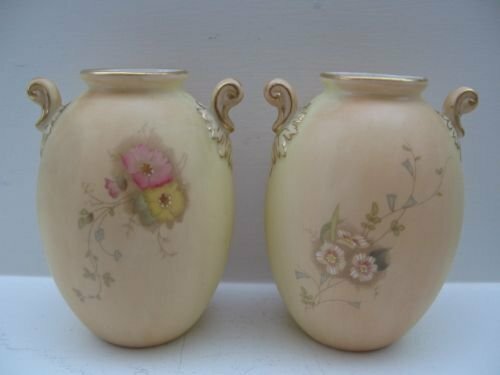 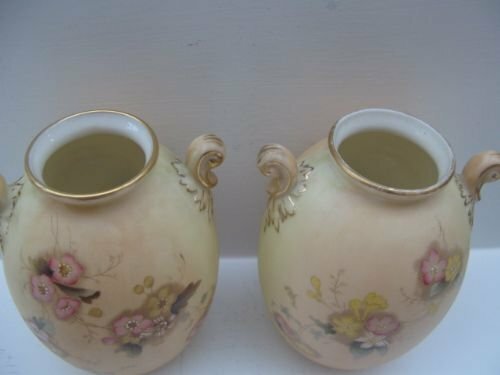 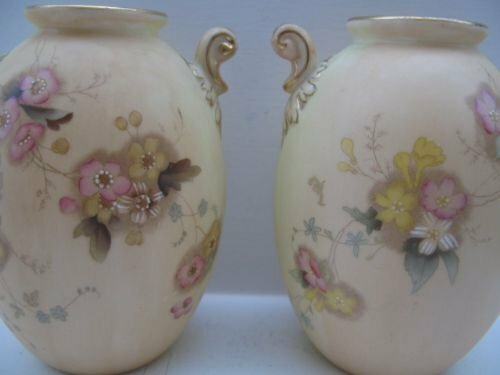 A Pair Of Graingers Royal Worcester Blush-Ivory Vases. 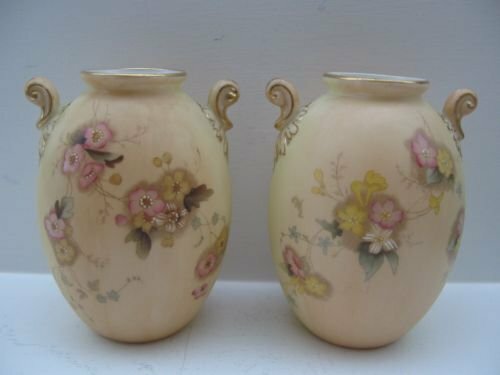 A pair of Graingers Royal Worcester blush-ivory porcelain vases, shape number G559, with hand painted spring flower decoration. 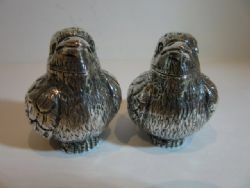 Standing approximately 4.3/8"tall x 3.1/4"tall, they have the dark green factory stamp for 1899 and are in very good condition with no damage, crazing or restoration, and the gilding shows only slight signs of wear. 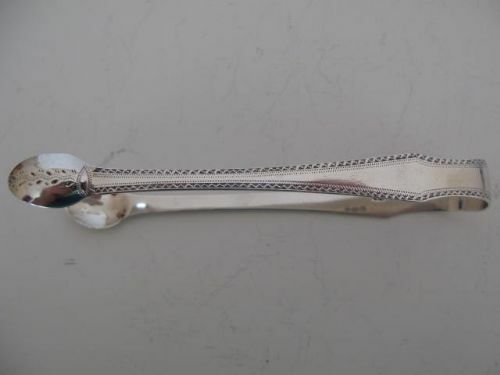 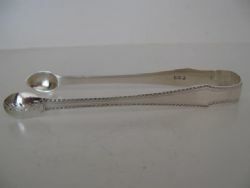 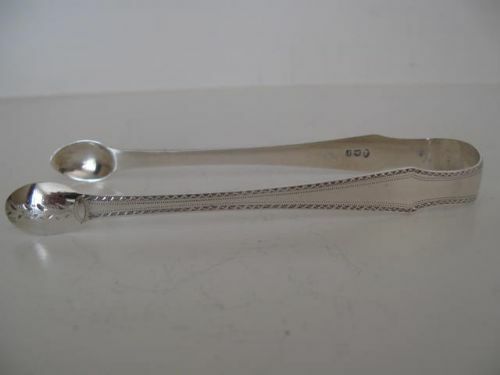 A Pair Of Bright-Cut Silver Sugar Tongs, London 1801 By "SA"
An attractive pair of George III solid silver sugar tongs with bright-cut decoration, hallmarked for London 1801 makers mark "SA". 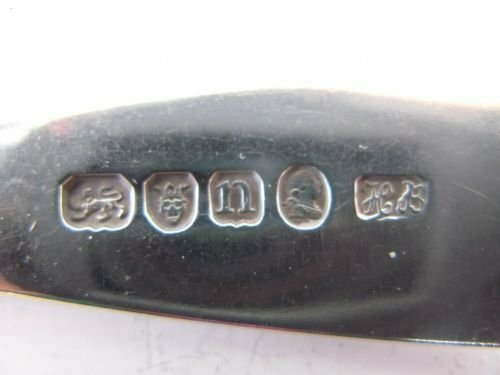 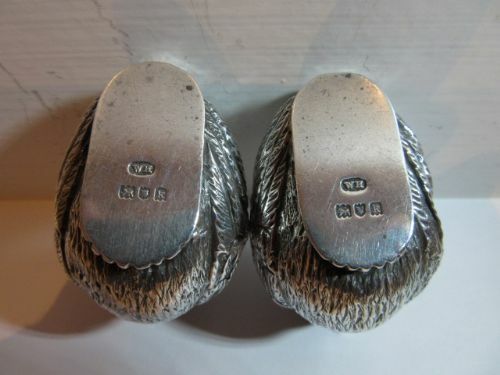 Measuring approximately 5.1/2"long x 2"wide x 1/2"deep, they are in very good condition with no damage or repairs, no rubbing to the decoration and the hallmarks are well struck and clear. 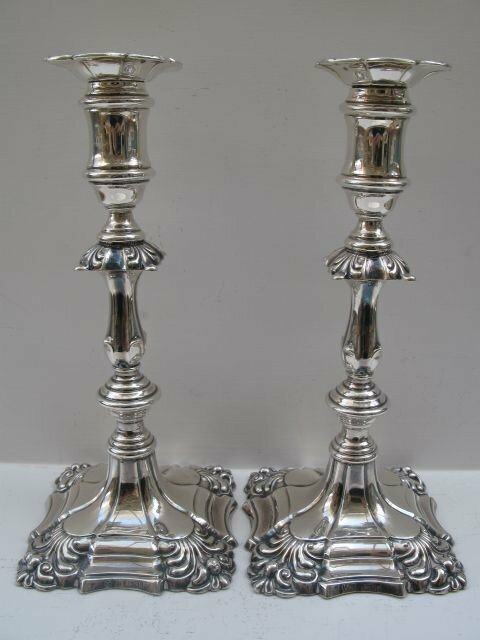 A Pair Of Edwardian Loaded Silver Candlesticks, Birmingham 1904. 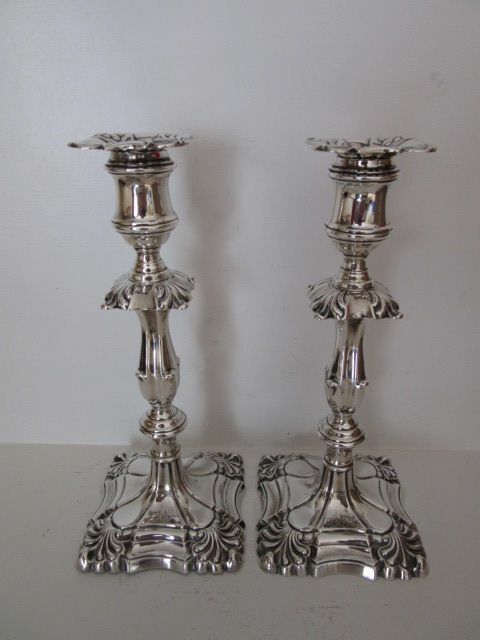 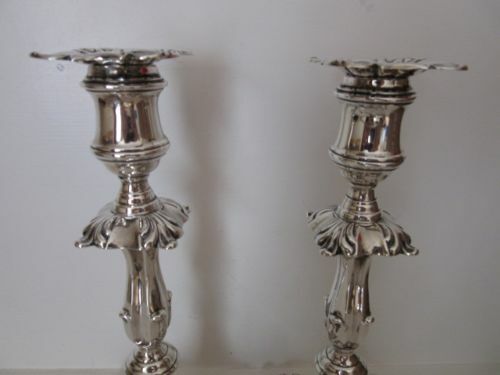 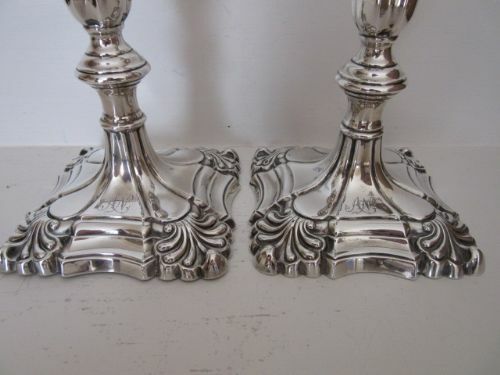 An attractive pair of Georgian style, loaded silver candlesticks, hallmarked for Birmingham 1904 by I.S.Greenberg & Co. 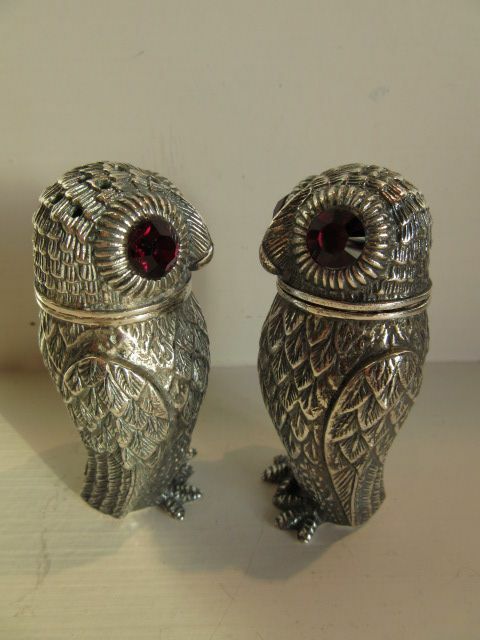 They stand approximately 9.1/4"tall with 4.1/4" square bases, and are in very good condition with clear, well struck hallmarks, no repairs and only one or two minor dinks to show for their 108 years of life. 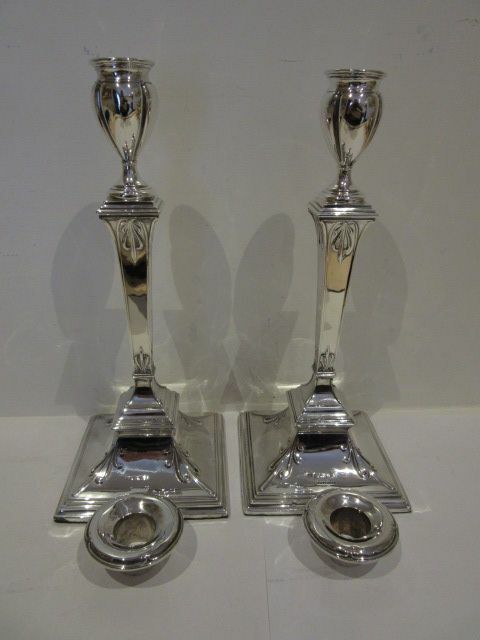 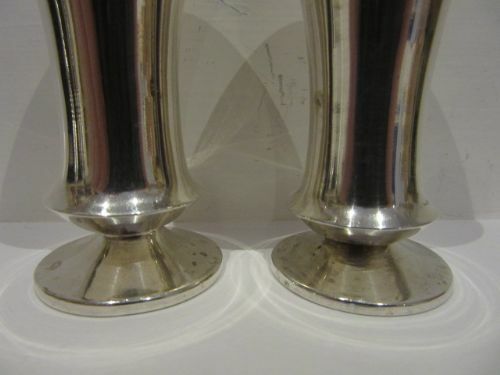 A Pair Of Edwardian Silver Candlesticks By Martin Hall and Co.
A good pair of loaded Edwardian silver candlesticks with detachable nozzles, in typical George II style. 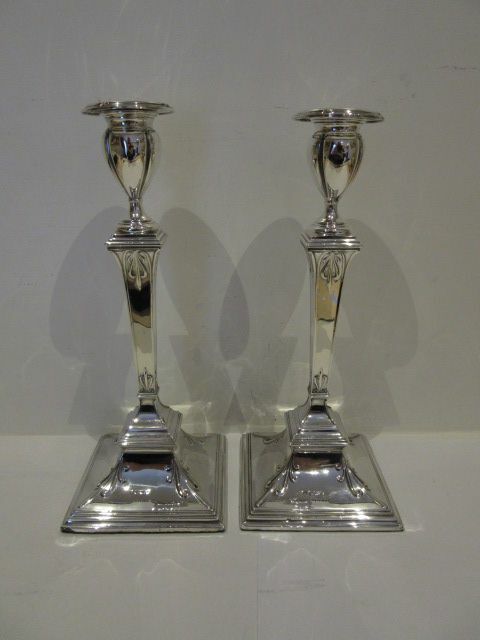 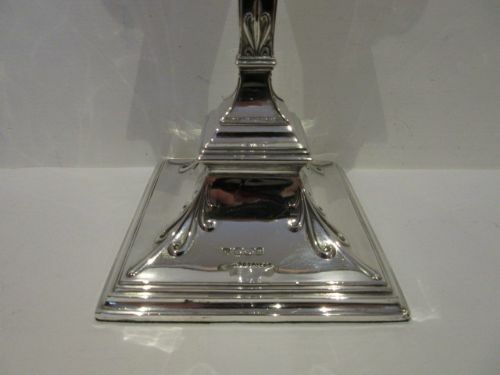 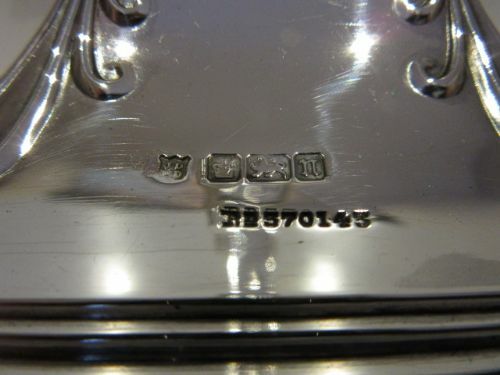 Measuring approximately 10"tall with 4.1/4"square bases, they are fully hallmarked for Sheffield 1904/5 by Martin Hall & Co Ltd who are very well regarded for the quality of their manufacture, and are in very good condition with no damage, splits, solder repairs or holes to the high points. 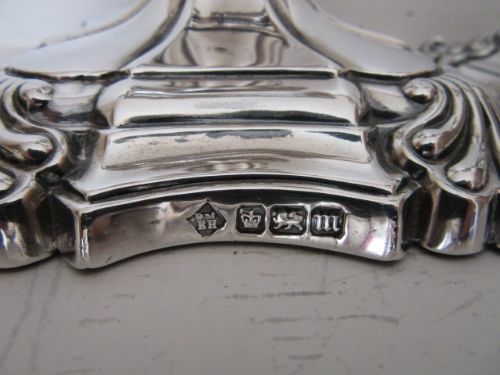 The bases are lightly inscribed with the initials "A N" and the hallmarks are clear and well struck. 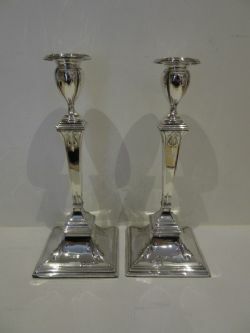 A Pair Of Edwardian Silver Candlesticks, Sheffield 1905. 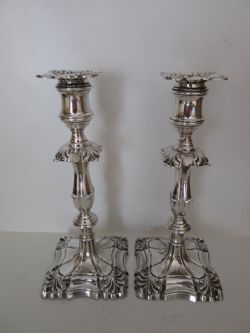 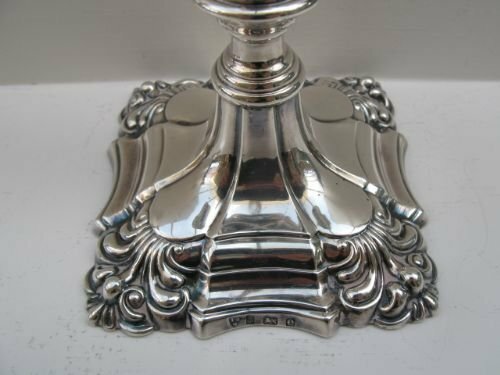 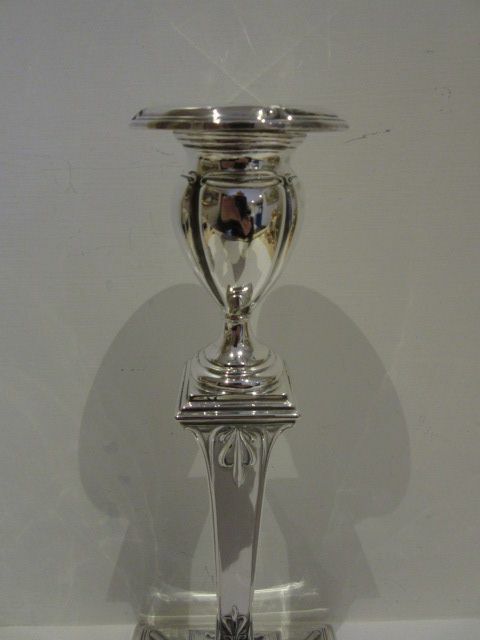 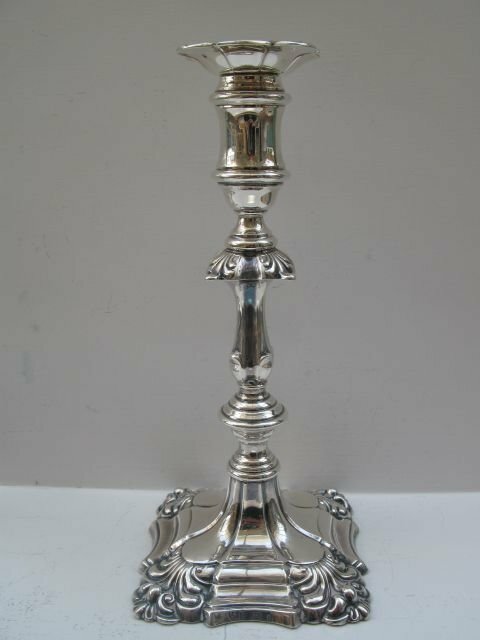 An attractive pair of Adam style Edwardian silver candlesticks, with detachable nozzles and tulip shaped capitals above the elegantly embossed columns. 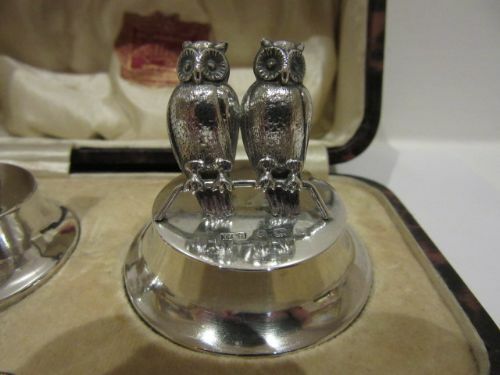 Standing approximately 10.1/4"tall with 4.1/4"square bases, they are hallmarked for Sheffield 1905 by James Deakin and Sons and are in excellent condition with no damage, dents, rubbing through of the high points or solder repairs, and they stand straight and are without movement. 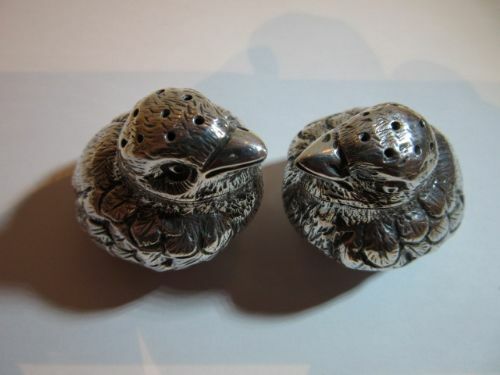 A Pair Of Edwardian Silver Novelty Pepperettes In The Form Of Chicks, London 1905. A lovely pair of Edwardian solid cast silver novelty pepperettes, in the form of finely detailed chicks. 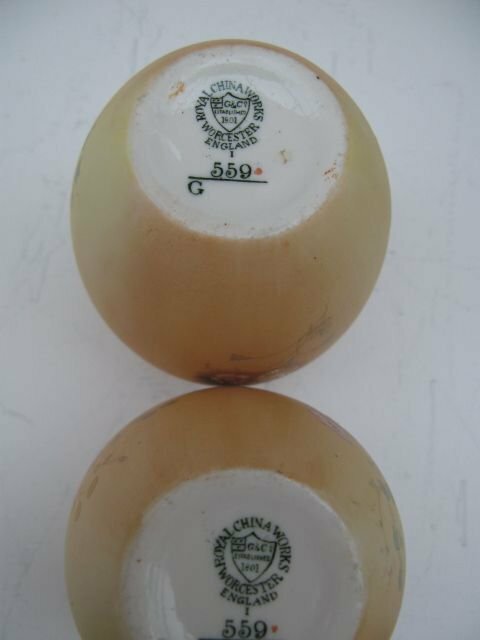 Measuring approximately 1.1/2"long x 1.1/4"wide x 1.5/8"tall, they have clear well struck hallmarks to the bases for London 1905 by William Hornby and are in excellent condition with no damage or solder repairs. 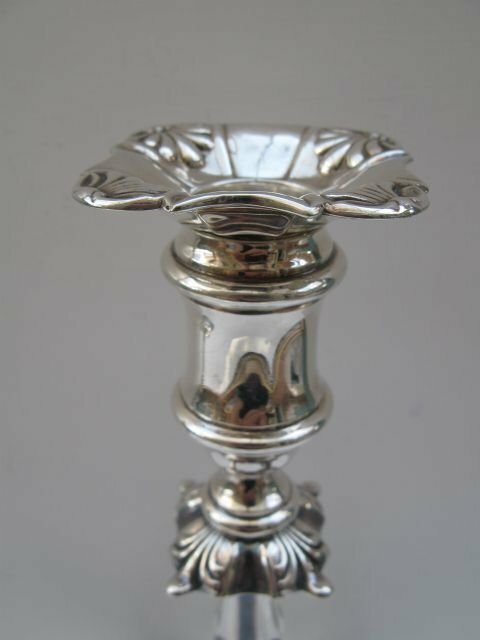 The detailing is crisp with only the slightest rubbing and the pull-off tops which are also fully hallmarked, are a very secure fit. 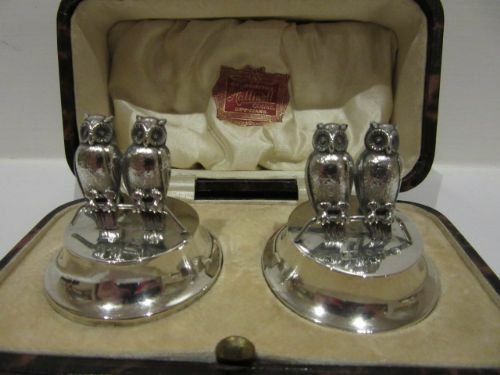 A very appealing pair of Edwardian, solid silver novelty place-setting/menu holders in the form of pairs of perched owls. 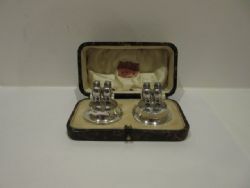 Measuring approximately 1.5/8"diameter x 1.1/2"tall, they have clear hallmarks for Birmingham 1910 by Isaac Summers and coming complete with, and having presumably spent most of their lives in their original presentation box, they are in excellent condition with no damage, repairs or dents. 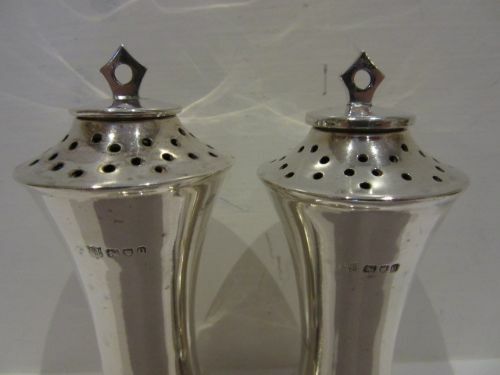 A Pair Of Edwardian Silver Pepperettes, London 1909. 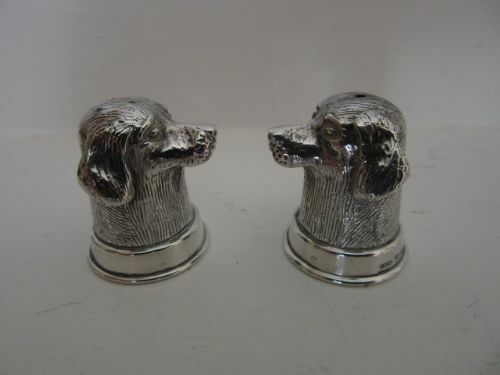 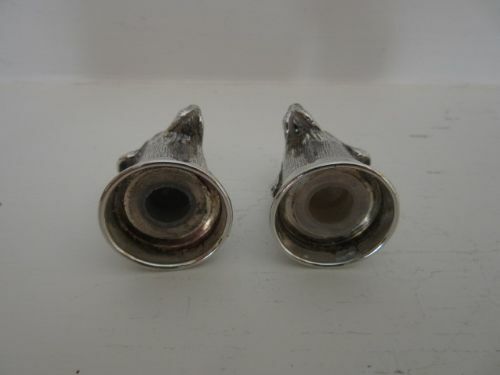 A nicely styled pair of Edwardian solid silver, spool-shaped pepperettes. 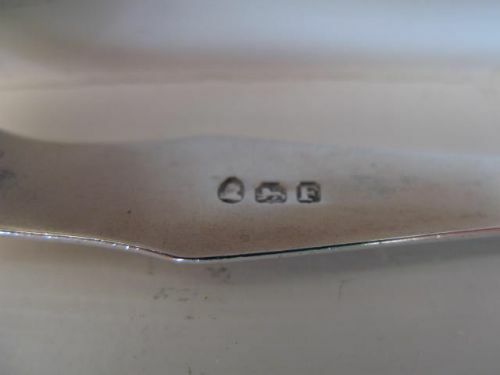 Measuring approximately 3.1/2"tall x 1.1/2"maximum diameter, they are hallmarked for London 1909 by Stewart Dawson & Co. Ltd, and are in very good condition with no damage, dents or solder repairs and the hallmarks are well struck and clear. 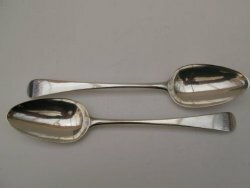 A Pair Of GeorgeIII HESTER BATEMAN Silver Tablespoons. 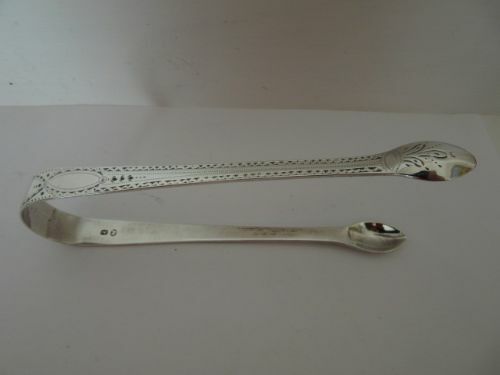 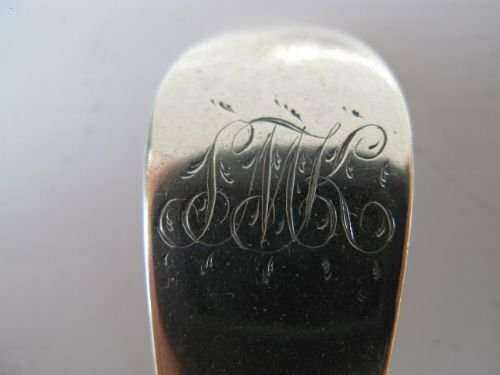 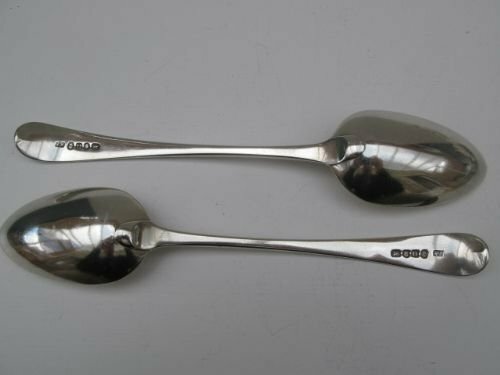 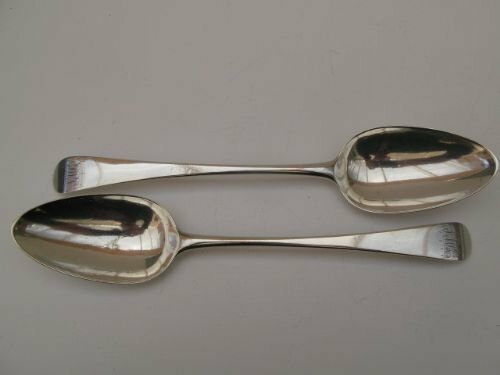 A nicely proportioned pair of GeorgeIII "Old English" pattern silver tablespoons, 8.5" long, initialled as shown, and in very good condition with no damage or repairs. 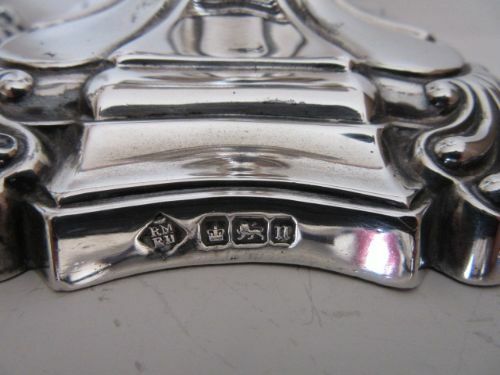 Very well struck hallmarks for London 1788 by Hester Bateman. 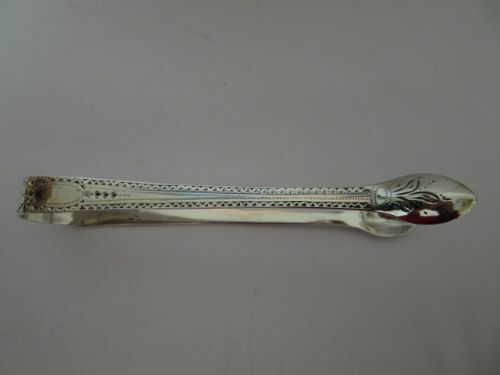 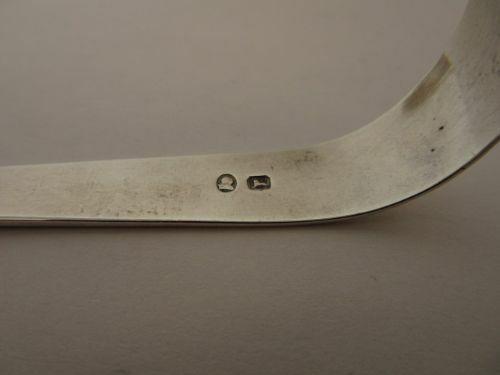 A Pair of Georgian Bright-Cut Silver Sugar Tongs, Circa 1790. 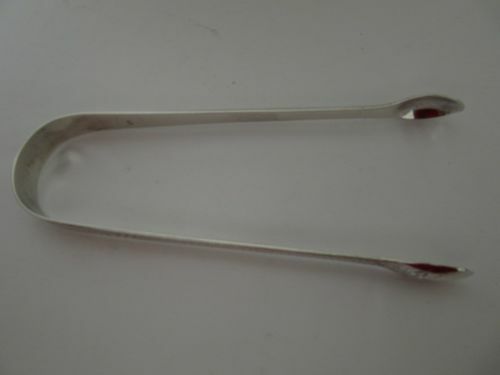 A pair of George III solid silver sugar tongs with attractive bright-cut decoration and a stylised initial which I think could be an "L" or an "R". 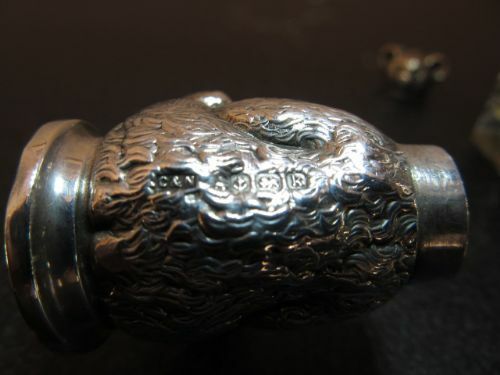 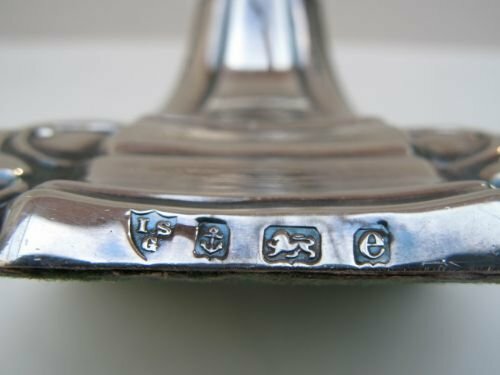 Measuring approximately 5.1/2"long x 2.1/8"wide over the bowls, they have partial hallmarks comprising the lion passant sterling mark, the sovereign's head mark in cameo and the the maker's mark "CH", which gives a date of manufacture of circa 1790 by Charles Hougham. 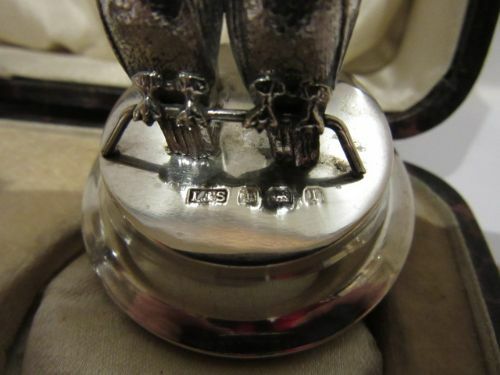 They are in lovely condition with no damage or repairs, the legs are straight and the engraving is vitually without wear.